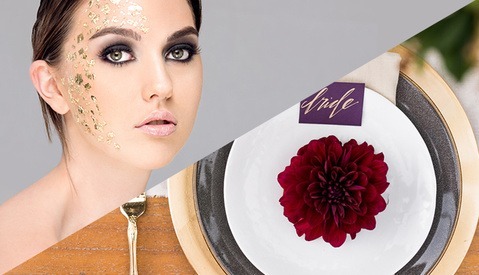 Welcome back to our series on pricing your commercial photography. A few weeks ago we released Part 1 of the series which explored the benefits and pitfalls of working for free. As we explored the topic it became evident that working for free has its place but in order to create a sustainable and professional industry we must educate our community on the importance of properly pricing their work. 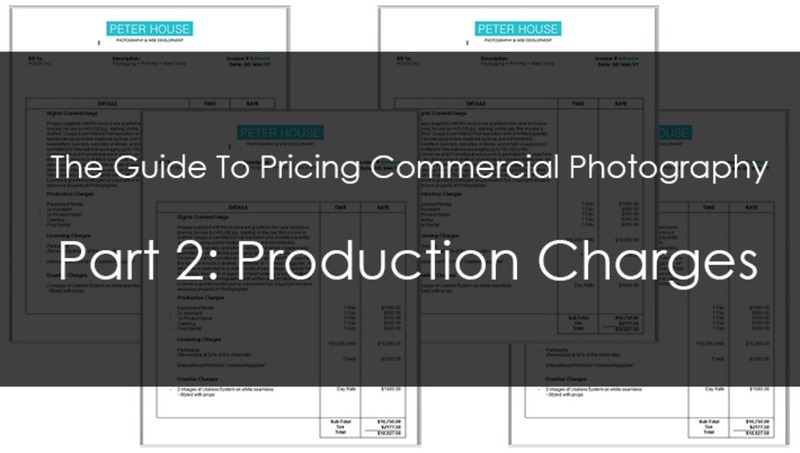 Thus in Part 2 we will begin by showing you my personal approach to laying out a commercial invoice and the thought process behind the layout. This is a layout I have developed over the years and it has been well received by clients because it is easy to understand and navigate. My personal layout is by no means the ONLY way to do things. I highly encourage you to build and develop methods for your own pricing strategy and for your own markets. However the concepts and reasons I present here will remain fairly universal across all markets. Regardless of how you want to present your own invoice the strategies for fair pricing will still apply. For our purposes we need a client. So off I went to the kitchen to grab a coffee and made one up. I present to you “High Output Useless Systems Engineers Inc” or “HOUSE Inc.” for short. As the very descriptive name implies, HOUSE Inc. is made up of a very small but talented team of engineers who have developed some useless technology that increases output tremendously. While I was waiting for my coffee to brew, House Inc. informed me that they are getting ready to launch their latest and greatest useless product, and they will require 2 images in order to showcase their new invention. These 2 images will be used worldwide for packaging as well as in print ads that will appear in one large technical publication that targets their market. Sounds like a fun project! First, let’s take a look at what my invoices look like. There you have it. That right there is a stripped down basic version of my invoice. You would of course fill it in with the details of your own individual projects. Let’s go ahead and do that with our new client “HOUSE Inc.” All my numbers will be completely arbitrary and won’t mean much to you as each market and industry will have its own price point at which you can compete. That is something we will explore in a future article, in the meantime, keep your focus on the method. As you can see I have my invoice split into three categories. This will allow us to keep everything organized and to present the charges to the client in an itemized and visual way so they can easily see the breakdown of where their money is going and how it is being put to work. In order to keep your attention, and shamelessly build some suspense, we will only be going over the production charges in this article. That way I can better explain what exactly those are and how we want to tackle them, and you the lovely audience, has something to look forward to in the coming weeks. Production charges are simply the costs incurred by you, the photographer, in executing the production of the images you were hired to create. This section does NOT include your own fee for creating the images. We will leave that for another section and a future article. Every photo shoot and project has some costs involved. In a recent article by our own Gary Martin he explored the anatomy of a $100K commercial estimate. If you look over the invoice that is presented in his article you will notice there are a LOT of production costs and they are the major contributing factor to the higher price tag. Productions come in all sizes and price ranges. Some projects might require you to hire a set designer and some handymen to put together an elaborate backdrop. Some projects will be in a foreign land and you will need to hire a translator and a location scout. Some projects might have a team of 20 people all of whom need to be fed for the next 3 days. The one thing these expenses have in common is that they are absolutely crucial to the smooth and timely creation of your images, and as such, the expenses are passed on to the client through the “Production Costs” section of your invoice. In the “Production Costs” section you will want to add up all these expenses that will be incurred during your production. When creating an estimate you are naturally “estimating” things to the best of your ability so you will need to come up with standard amounts from your experience, or from market research, that you will use to determine these expenses. For example, you might estimate that you need $50/day in food for every person on set. If you have 10 people on set, your catering budget would then be $500. It is also not uncommon for a photographer to add a mark-up to the expenses to cover the cost of their own time and effort. For example if you are renting equipment for $1000, you might add a 20% mark-up to cover the time and gas it requires you to go and pick everything up. 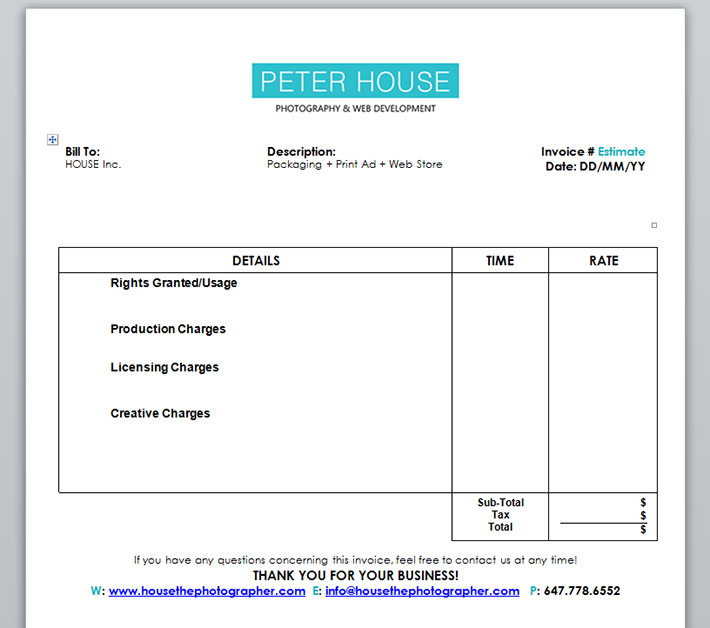 Here is how we might build the production charges for our client HOUSE Inc. The images they require are not overly complex, so our production charges will be fairly straight forward. I’m going to pretend their new product is a fairly large piece of equipment so it will require some specialty equipment to be rented. We have tacked on a fee of $1000 for that in our example, which includes a mark-up for transportation and time. Since the product is large I will require 2 assistants to help me move and position the product. Their extra hands will also come in handy, no pun intended, to help position all that specialty equipment and lighting we have rented. I will also hire a product stylist for the day to help create a flawless image. To keep things simple, I will shoot these images on a piece of seamless white paper, in my own studio. 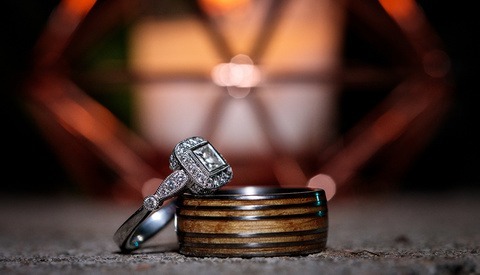 Since we need 2 images I will only need one day to create this so all our rentals and hires will be for a single day. I am also including a prop rental fee. I’m pretending the client might want to add some props in these images, and of course, that is a cost of production so we will add it here. Point by point you will add up all you expenses just like a store receipt. That is it! There is not much more to our “Production Costs” section. 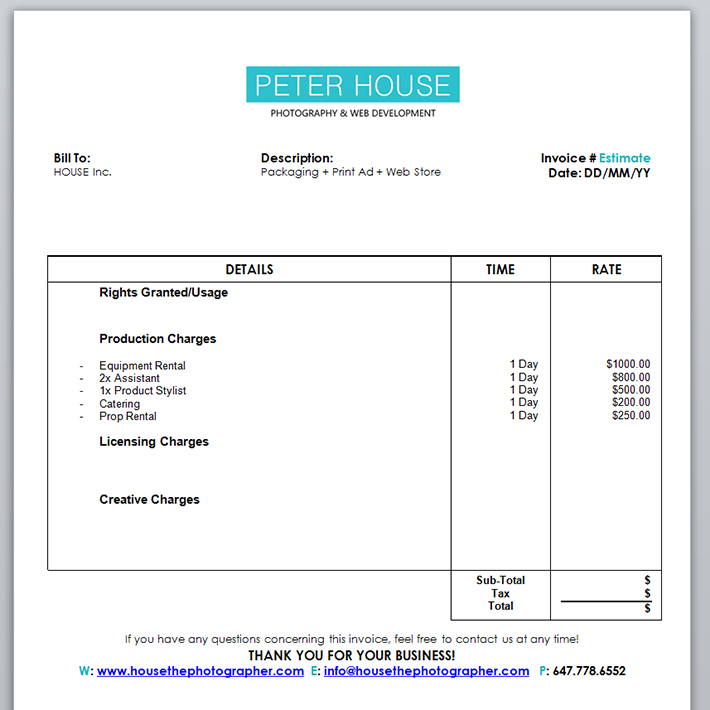 The bottom line here is, figure out what it will cost you to create the images, and then charge the client for it. Don’t be afraid to show the client all your expenses. 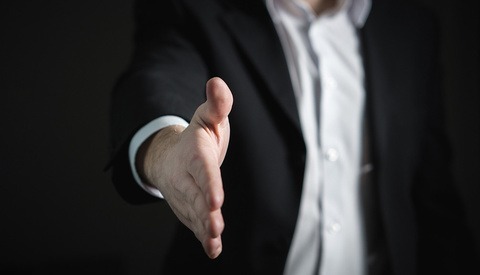 In my experience a client will appreciate seeing how you intend to spend their money, and by being open about everything, you will actually come across as more responsible. Instead of trying to lump your expenses under generic blanket statements, take the time to be a bit more descriptive with your spending. Some folks might have a tendency to feel guilty about all these charges, but you shouldn’t. The client knows and expects there to be costs associated with production. They will understand that this is not going to be a project funded by you. Clients will appreciate an itemized list of all your expenses and will actually develop a greater sense of respect for the sheer amount of work and thought you are putting into their project. That concludes this edition of “The Guide To Pricing Commercial Photography”. As usual I hope you have found this an interesting and resourceful read. Stay tuned for future releases which will cover the creative fee and licensing portions of our invoice. Till next time! Feel free to visit me anytime at Peter House – Commercial Photographer to follow our work. Peter House is a commercial fashion photographer from Toronto, Canada. He shoots over 10,000 pieces of clothing every year for a variety of lookbooks. Clients range from small local boutiques to international brands such as Target, Winners, and Sears. In addition to that Peter runs one of the most popular rental studio's in the Toronto area. Would You Let a Computer Critique Your Photography? Thank you so much, I'm in a similar situation and this helped me a lot. Exceptional article and one I hope get shared often and widely. A great book on the subject is "Advertising Photography: A Straightforward Guide to a Complex Industry". It discusses this and many other topics. Also, ASMP has a guide that covers many other topics. Some great resources for information and knowledge and I greatly appreciate your taking the time to put this out there on the web. Hey, great article -- what program can I use to create an invoice similar to the ones above? What software do you use to build your invoice?